It’s possible I will never eat another plain olive again. 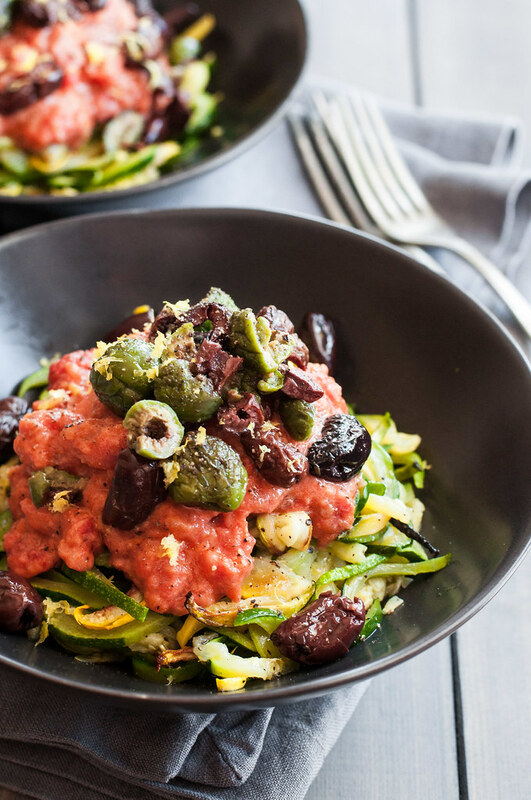 Buttery roasted zucchini noodle pasta and creamy goat cheese tomato sauce are both good and fine and completely scrumptious, but oven baked blistered olives steal the show in this meatless dish. When I wasn’t tending to my broken fiancé over the weekend, all I thought about was the format of a new tomato zucchini pasta recipe. At first, I planned for a simple fresh tomato sauce with raw zucchini noodles, but I got behind schedule, and as summer fades to fall, it isn’t fair to taunt you with fresh tomato sauce when there are few edible tomatoes left. 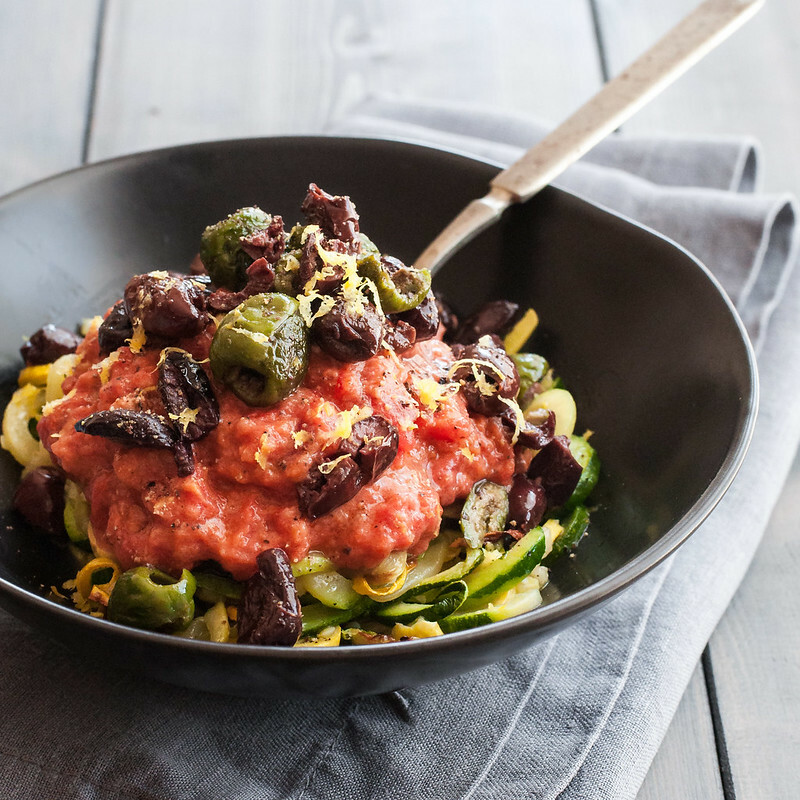 Then I wanted to do zucchini spaghetti with my quick tomato sauce, topped with a big dollop of olive tapenade, but it occurred to me that to properly pay respect to tapenade, I’ll need more than two days to research and recipe test and consult a few experts. I finally conceded that simply tossing olives on top of a big pile of warm noodles and sauce would not equal defeat. Far from it, especially when those olives are roasted to tender, juicy perfection and have all the good parts about the taste of deep fried food, without the trans fats or stomach ache. Needless to say, my expectations for zucchini spaghetti were beyond exceeded. Steve looked on in mild disgust as I uttered, between and during mouthfuls of creamy zoodles, “oh my goodness, this is the best…you have to try these olives”. Then again, maybe I’m a little biased, because it’s the first real home cooked meal I made after a terribly eventful weekend. I got the call sitting at a stoplight on Saturday, heading home, and hungry, after some pre-wedding pampering. It was Steve, informing me in his calmest voice possible that I should meet him at the ER, where an ambulance would be depositing him momentarily. Aside from blanking out on the location of Stamford hospital, I didn’t, much to my surprise, panic, my stomach didn’t drop, and I didn’t need to pull over to compose myself. I grew up the daughter of a cyclist, and now I’m about to be the wife of a cyclist, and it’s the call I subconsciously dread every time I casually say goodbye to Steve before a ride. No matter what I’m in the middle of, though, I make sure to send him off, as I watched my mom do to my dad for as long as I can remember, with a kiss and an I love you and a quick little prayer for safety. But you never think it will happen, until it does. A brief ten minutes of rain on Saturday caused a particular minivan driver to pull out of the gas station without looking both ways. Steve swerved out of his lane to avoid her, and thanks to a green light, he was about to make a full recovery as she rolled by, not even waving to apologize. Instead, she reacted to the rain or her cell phone or who knows what by slamming on her brakes when the light told her to go, and Steve again swerved, this time to avoid going through her back windshield. While the newly slick roads did save him from becoming a bloody mess, they also caused him to loose control amidst some very tricky bike handling, flying over his handlebars and rolling across the road. To use an internet marketing cliché, you won’t believe what happened next. His acrobatics landed him smack in front of the minivan driver, and as he recovered, she drove around him, dismissing the scene as she might a plastic bag floating across the road. I’m a little shocked at my complete, honest lack of any feelings toward this driver besides the emotional equivalent of a side eye. I have plenty of other places to direct my energy, I suppose, like helping Steve as he one-handedly heals from a broken collar bone. After 48 hours of extreme pain, discomfort, swelling, and Perkiset, he’s turned a major corner. We went to Starbucks after seeing the orthopedist yesterday, and I didn’t even get to beat anyone up for coming within three feet of him! I have to admit, the zucchini spaghetti is the best meal we’ve had in the last couple days, as I get a taste of the non-stop nursing profession. However, I did find time to make chocolate chip cookies from Heidi‘s cookbook, and the addition of butterscotch chips and a smear of leftover vanilla buttercream icing rendered them almost as good a painkiller as the prescription meds. Thank you so very much to all the friends and family and coworkers who’ve expressed support in the last few days. I’ve not been particularly responsive, but we’ve been reading every comment and text. This flexible fun thing that I call a job is making all the difference and keeping us on our feet as we make our own, somewhat nocturnal, new schedule. What I would like to ask from you, whether we’re family or strangers, is to be on the lookout for others no matter how you’re getting around. If a cyclist in the road is freaking you out or even acting stupid, just slow down and give it a minute. Take responsibility, breathe deep, and let the oncoming car pass or the cyclist make their turn, and don’t ever take for granted coming home to a big, comforting bowl of saucy zucchini spaghetti with the people you love. 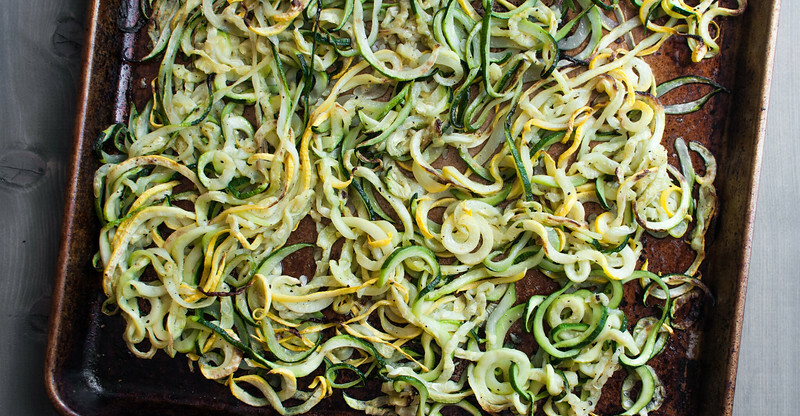 About those zucchini noodles. The rarely advertised downfall of this inventive veggie pasta is its high water content and, yes, often soggy noodles. By roasting the noodles as I decided to do here, you dry them out more than blanching or sautéeing, and, if you aren’t afraid to use a little butter, they end up with scattered golden brown spots of rich flavor. The recipe calls for quite a haul of zucchini, but as water leaves them during cooking, they shrink down. Needless to say, they also have far fewer calories than traditional wheat pasta noodles. The fiber will fill you up, but personally, I like a good sized bowl if I’m having zoodles. 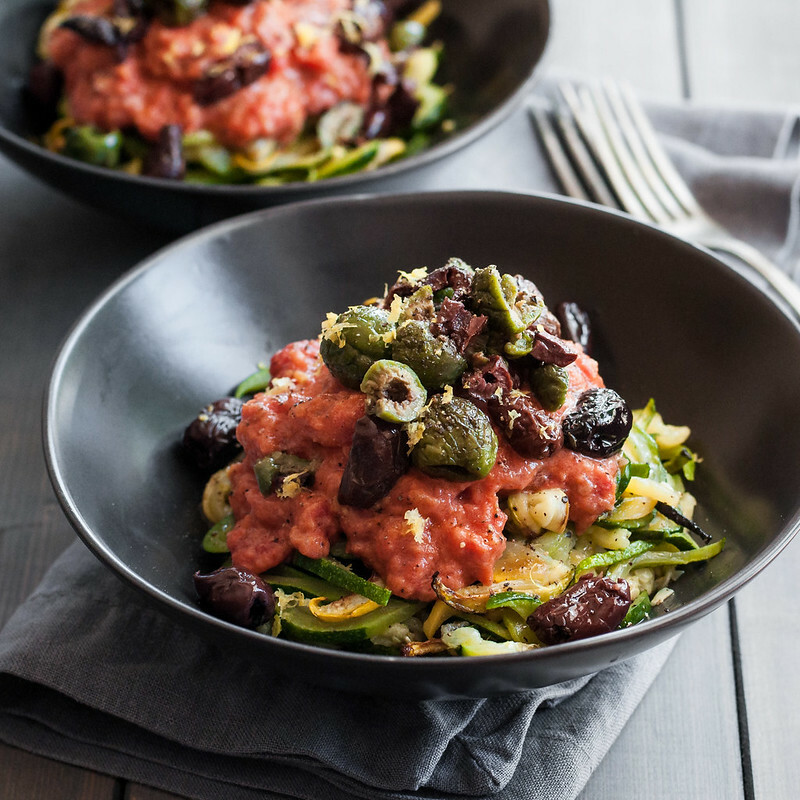 In this case, trust me on the zucchini quantity–you’ll need it all to match the pile of tangy goat cheese tomato sauce! I have this one. It’s one of those kitchen tools that’s so inexpensive and so versatile, I wonder what took me so long to buy one. I found mine at Williams Sonoma, but if you buy it online (for the same low price) with this link, Amazon will send a few bucks (ummm, okay, more like a few cents) to keep NCK up and running. 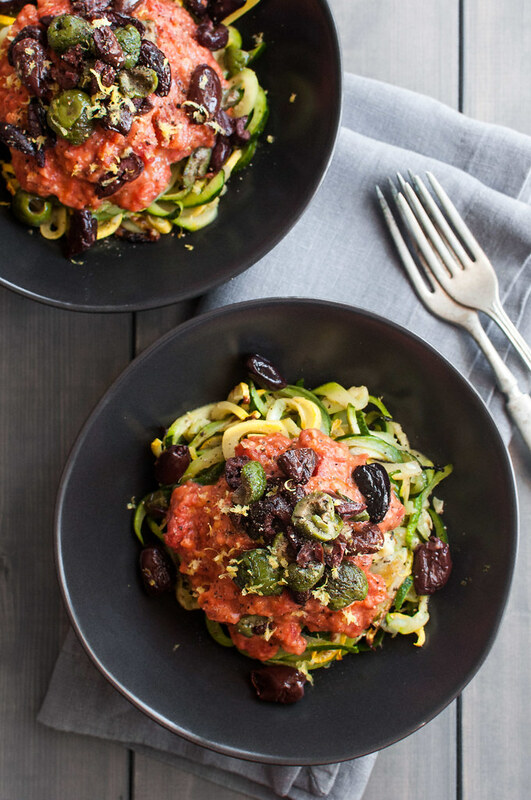 Rock your spaghetti AND olive worlds with creamy tomato zucchini spaghetti and blistered olives. 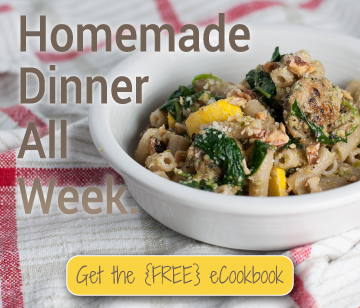 A "pasta" dinner with no gluten, no meat, and no guilt. If you have time, let the goat cheese come to room temp for half an hour. Warm the tomato sauce, stir in goat cheese until melted and fully incorporated, and keep warm over low heat. Preheat oven to 425 (F). Drain (don't rinse) and lightly dry olives on a paper towel. Spread on a rimmed baking sheet (this size works great) and toss with 1 teaspoon olive oil, vinegar, a few grinds of black pepper, and the herb sprigs, if using. Bake 20 to 25 minutes, on middle oven rack, stirring once or twice, until blistered and a bit wrinkled. When cool enough to handle, roughly chop half the olives, then combine all olives in a small bowl. 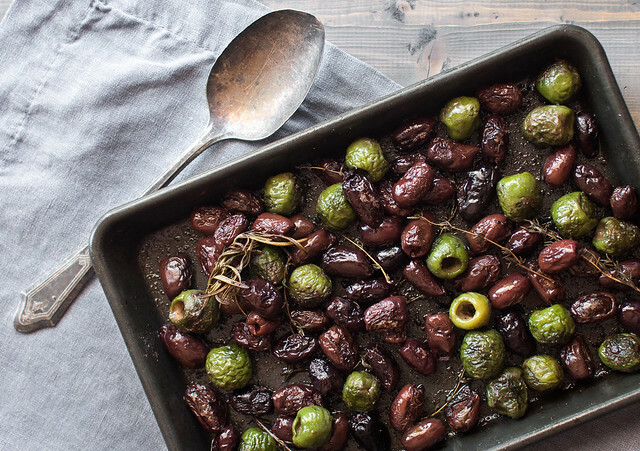 Olives can be served warm or room temp. 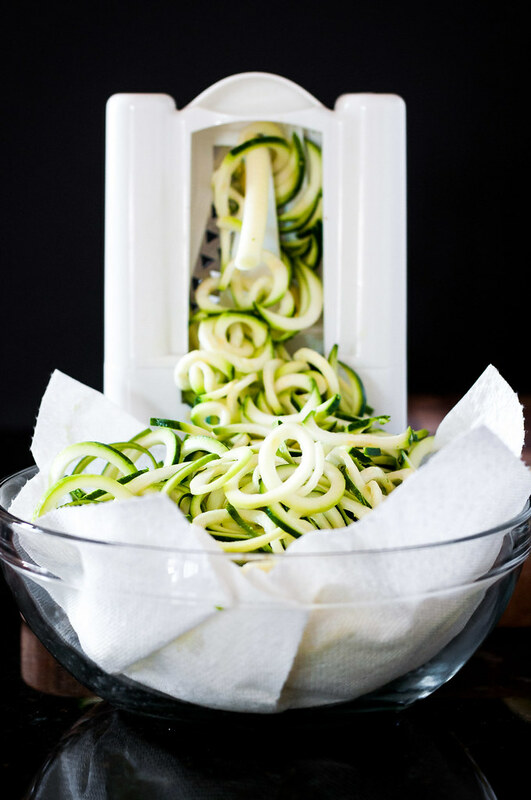 Spiralize zucchini on thick noodle setting, or make noodles with a julienne peeler. Place in a bowl lined with a paper towel, to remove some of the moisture. Turn on broiler (to high, if that's an option). Place "noodles" on a large rimmed baking sheet. Melt butter and combine with 2 generous tablespoons of oil, then drizzle mixture over zucchini. Toss to coat well and sprinkle with pepper only. Broil about 6 inches from heat for 10 to 15 minutes, tossing or turning once or twice. When done, noodles should be tender and beginning to brown. Sprinkle with salt. To serve, spoon warm goat cheese sauce over each helping of zucchini spaghetti, then top with a fourth of the olives, more pepper, and a dusting of lemon zest, if using. Twirl away and enjoy! I found this awesome olive and herb goat cheese from Vermont Creamery (not sponsored). It's perfect with the olive theme! For best results, use your favorite olives from a jar or your grocer's antipasto/olive bar (not canned). Marinated varieties with herbs added would be delicious! You can substitute olive oil for butter. The noodles may not brown as they roast. As written, recipe is vegetarian (if using vegetarian goat cheese) and gluten free. Note: This page contains affiliate links. It does NOT contain sponsored content. Affiliate links (to products I recommend, on Amazon) offset my ingredient and website maintenance costs, so I can keep bringing you delectable recipes like this one. Thanks! I’ve been in a serious olive kick lately, but I have never thought to roast them! Adding this to my “must make” list! Plus goat cheese is delish. You’re going to LOVE them! Slash hate them, because holy cow, are they addictive. Gorgeous dish! Just pinned it!